Now is the best time to start investing on your dream home. 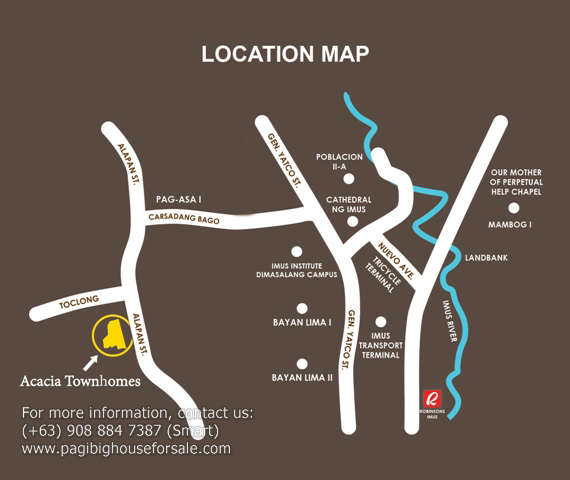 You will never find a Pag-ibig housing with super low monthly equity at a superb location like Acacia Townhomes plus you get discount of Php40,000.00. Super affordable. So, don’t miss this chance to buy and finally own and stop renting. Take bus via Cavite Expressway with sign board Naic or Maragondon or Ternate or Tanza or Epza and get down in 7-11 Gahak. Ride tricycle to Acacia Townhomes. Take Alabang-Zapote Road then ride mini-bus with signboard Naic or Maragondon or Ternate or Tanza or Epza and get down at 7-11 Gahak (Front of Kartini Hotel). Ride tricycle to Acacia Townhomes.